Sonya Giffin brings with her over 30 years of professional expertise in business strategy, sales, communication and leadership. With an emphasis on finding and building the leader within everyone, Sonya discovered the dynamic and transformative powers of horses on human interactions. 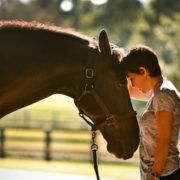 Combining the best of her practical, corporate experiences with equine leadership workshops, Sonya works with individuals, executives and teams to bring clarity and purpose to their leadership styles.